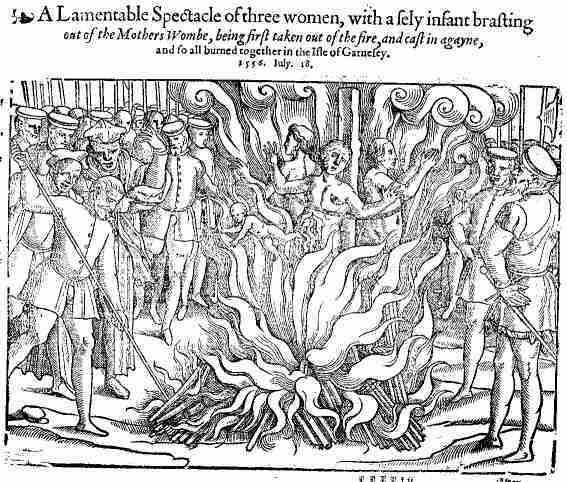 Listening to a podcast of the BBC Radio 4 programme In our time, hosted by the excellent Melvyn Bragg about Foxe’s book of Martyrs first published 1563. This is a book I’d only vaguely heard about. It contains illustrations of Christian martyrs in the act of being executed. My ears pricked up when one of the contributors started talking about Perotine Massey, a Guernsey woman burned, who gave birth during the awful procedure. The baby was tossed back into the flames too. Much more can be found on this matter here on this Guernsey Museums page. This entry was posted in Uncategorized and tagged Foxe's book of Martyrs, Guernsey, In our time, Melvyn Bragg, Perotine Massey. Bookmark the permalink.